Migrante Party-list today declared that it would join ACT and Courage Party-lists in fighting against the Commission on Elections’ apparent move to block the participation of progressive party-lists in the 2010 elections, saying that the poll body had exposed itself as a tool for political repression and electoral fraud. “First, it denied representation to millions of Overseas Filipino Workers. Now it has denied representation as well to hundreds of thousands of teachers and government employees. Comelec chairman Jose Melo and the other commissioners must be dismissed and held accountable for their bastardization of the Party-list System. 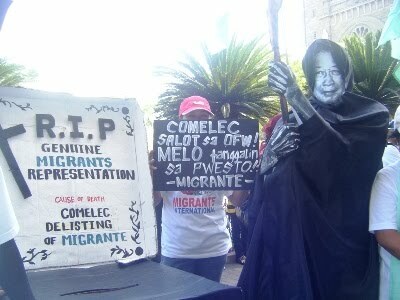 “The Filipino people cannot trust the Comelec to hold clean and honest elections, when it has already shown an obvious bias against party-list groups known to be critical of the administration,” said Connie Bragas-Regalado, Migrante Party-list chairperson. According to Regalado, the poll body has resorted to twisting the law and outright lying in order to justify the de-listing of Migrante and disqualification of ACT and Courage. “For instance, it carried out a verification of Courage chapters but came out with an incorrect report that failed to recognize existing chapters and attributed to them non-existing ones. In Migrante’s case, it equated non-participation in the elections to failure to obtain 2% of total party-list votes. On the other hand, did the Comelec ever prove the constituency of administration-backed party-list groups such as Jovito Palparan’s Bantay and Lourdes Arroyo’s Ang Kasangga? Until now, it is not even clear what marginalized sector they represent,” she said. 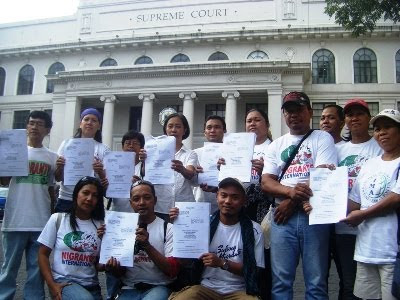 The migrant leader is confident that “the Comelec’s flawed decisions will not fool the Supreme Court,” but expressed concern over the nearing December 1 deadline for filing of manifestations of intent to run. “It is imperative that the court act quickly on the matter. Will it allow the fate of marginalized OFWs, teachers, and government employees to rest on a handful of politically motivated commissioners? Will it allow the Party-list System to be fully bastardized?” she added.